The Away Carry-On is perfectly sized for current airline carry-on regulations and is easily one of the lightest carry-on bags I have ever had the pleasure of owning. Weighing in around 7-lbs, the bag is easy to lift, even when packed to the brim with necessities for a trip away from home. 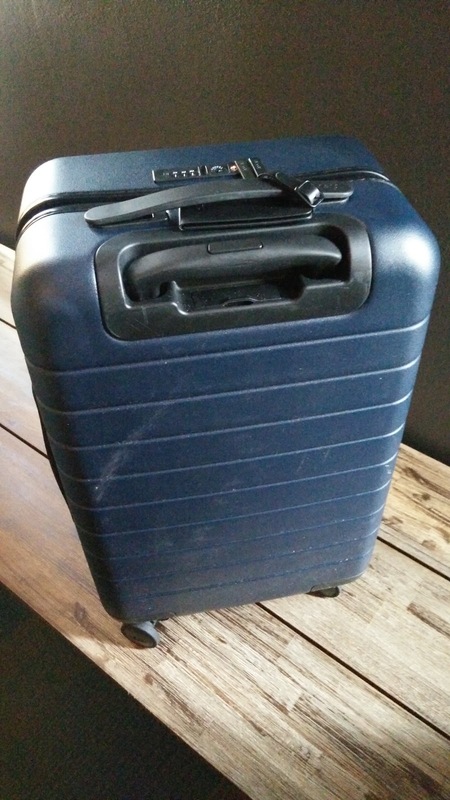 It's compact dimensions and diminutive weight make it a perfect companion for a week-long business trip, where my packing can be kept to a bare minimum, or a few days getaway from home. 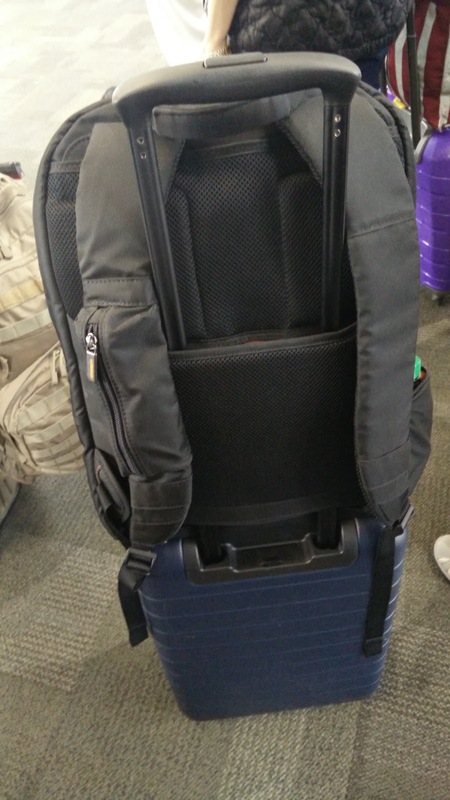 Paired with by trusty Briggs and Riley backpack, which houses my work essentials like my laptop and notepad, I can fly across the country on business for a week and not worry that I will run out of space. 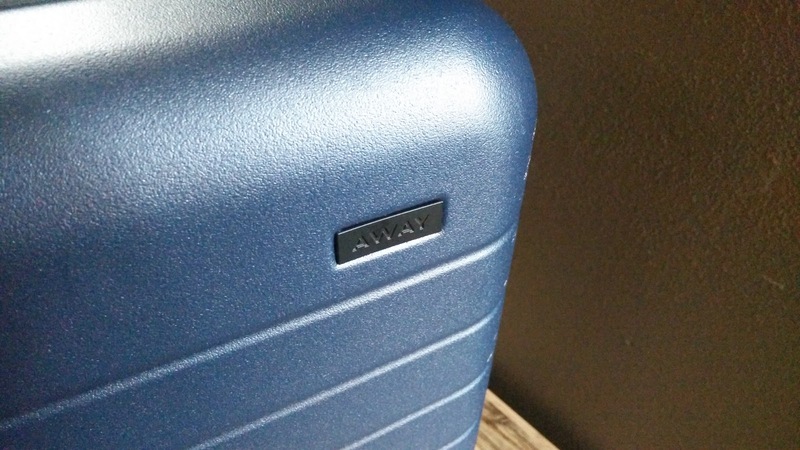 One of the key features of the Away Carry-On, and something that helped to justify the $225 price tag, was the inclusion of a built-in 10,000 mAh Li-Ion battery pack. With dual USB ports, one voltage and one low voltage, tucked into the pull handle's storage slot, the bag is able to provide a charge for two power hungry devices, usually my phone and my tablet, without needing to fish anything out of my bag. The ability to fully charge two devices comes in handy when trekking through airports that either have a lack of charging or when charging is simply impractical because you cannot afford to stay tethered to the same location for 30+ minutes. Being able to plug a phone in and have it charge while on the run is definitely a huge plus in my book. In case you end up boarding late and needing to check the bag, a mini-screwdriver is included in the bag to allow you to quickly remove the pack and pop it into your personal item to carry onto the plane. 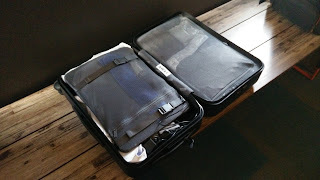 Inside, the Away is smartly organized, with one side that is a large mesh compartment, perfect for oddly shaped objects like shoes or toiletry kits while the other side has a divider that also doubles as a way to compress your clothes to reduce the amount of space they take up and contains a mesh pocket to keep odds and ends. On the bottom in its own little pouch is a nylon laundry bag that can stay tucked out of the way when not in use, but comes in handy when you need a way to keep those smelly socks separated from the clean clothes. The tubes for the telescoping handles due intrude slightly at that battery pack does take up a bit of the space, but a little smart packing means that you hardly notice it at all. The outer shell of the Away Carry-On is made of a flexible plastic that has a surprising amount of give. The textured surface helps to avoid the appearance of scratches, although it does have a tendency to pick up bits of dirt when slid across a surface, such as the bottom of an airplane overhead bin. When my wife first saw the bag, she was concerned about its durability, but given that Away offers a lifetime warranty on the bag, I am much less concerned. Although, I must admit that the bag does come off looking a little flimsy and wobbly when empty, due to the design of the skirt around the central zipper. That zipper is sturdy and the zipper pulls slot into a TSA approved lock, making security a no-brainer. While available in a variety of colors, including several rather eye-catching hues, I opted for a subdued shade of blue that should both be easy to recognize, but also did not scream "look at me." With a wheel at each corner, the Away glides around with ease when empty. Load it up with clothes and it still moves smoothly across most surfaces, though I find that it suffers from the same problem as most spinner-type bags in that navigating on carpet can be a little rough at times. The long handle is more than adequate for slotting my Briggs and Riley travel backpack, although with how light the Carry-On is, if my backpack is pretty loaded up, the combined package can feel a bit top heavy while maneuvering around the airport. This is probably the only place where the low weight of the bag itself might actually work against it. Still, I am more than pleased with the Away Carry-On, especially as I have now had several opportunities to actually fly with it. 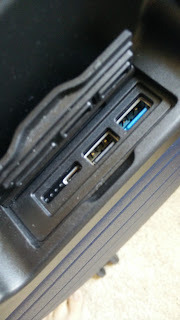 Speeding through an airport to make a tight connection was a breeze and having the option to plug my phone in when no other charging options were available made me the envy of many a fellow passenger. While the $225 cost of entry is certainly high for such a small bag, the prompt delivery, solid and well thought out product, excellent warranty, and seamless buying experience make it worth every penny. 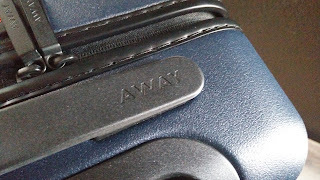 I would absolutely consider another one of Away's products when it comes time to replace one of our other trusty pieces of luggage.